Who is the Technicolor Teacher? "Sandy has all the intelligence, skills, dedication, collaborative spirit, love of learning, and passion for STEM education to make lasting contributions." Mrs. Powell is an award-winning STEM teacher. 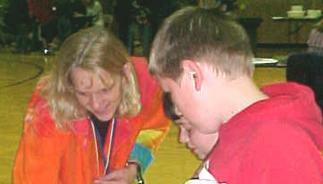 She was honored in 2013 with the Governor's Industry Award for Notable Teaching in STEM (GIANTS) as the secondary recipient, and was selected as an Idaho State finalist for the Presidential Award for Excellence in Math and Science Teaching (PAEMST) that same year. She was selected as a Bright Prism Teacher by Montana Tech School of Mines. Sandy has served as a mentor teacher for the Idaho Science and Aerospace Scholars (ISAS) Summer Academy and is acive in the Idaho Science Teacher Association (ISTA). She now teaches future teachers. For more information, about the upcoming Accessible Science News feature, click here.